My colleague, Dr. Mana Mann, and I arrived into Port au Prince on Saturday and were taken directly to Bernard Mevs Hospital by Medishare representatives where we remained until our flight home the following Saturday afternoon. Medishare is a non-profit organization founded by two physicians at the University of Miami School of Medicine. 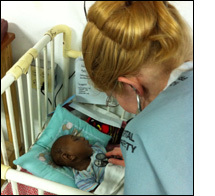 Medishare strives to provide care for the people of Haiti through the partnered efforts of both Haitian physicians and staff as well as volunteer physicians from all over the world. They organize physicians and nurses to go to Bernard Mevs Hospital each week, while also teaching medical students and providing medical supplies to associated clinics. Throughout our particular week long stay, I worked primarily on the pediatric hospital ward - a unit which contained beds for 18 children and neonates, while also consulting in both the triage unit (a one bed make-shift shack out at the front of the compound), and in the emergency room. The majority of the children who we treated had one of a few conditions (meningitis, sepsis, dehydration, respiratory issues, cholera, and hydrocephalus with mental status changes), although we also saw children with a variety of other medical issues including a post-operative child with an encephalocele, several post-operative VP shunt placement cases, two children with depressed skull fractures, and a child with a congenital cardiac malformation (VSD) requiring closure. Procedurally, we performed multiple blood draws, lumbar punctures, IV placements, abscess drainings, and resuscitations. We also read multiple xrays and helped to interpret multiple CT scans as well. We not only provided medical care, but also learned a great deal - not only about tropical medicine, but also Haitian culture. It was a very difficult but rewarding trip. I feel very lucky to have had the opportunity to work in Haiti. Thank you very much for your help in this process.